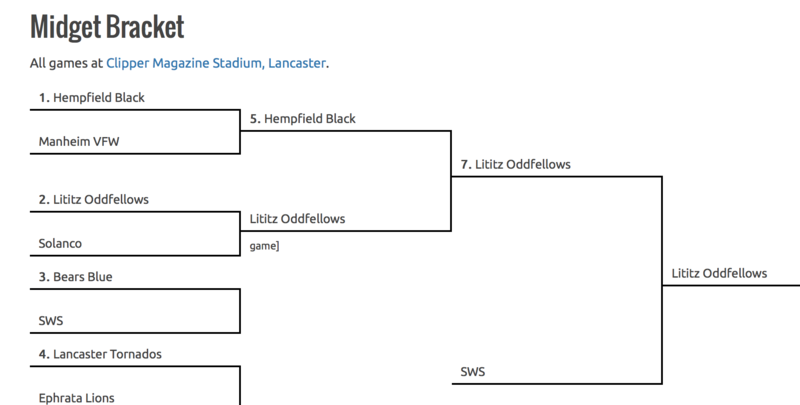 The Lititz Oddfellows have won the 72nd LNP Midget Tournament by defeating the SWS Pioneers 4-2 at Clipper Magazine Stadium Friday afternoon. Under the constant threat of rain, the Oddfellows behind the pitching of Colin Beech and Colin Brubaker held the Pioneers to just 4 hits. Add in the 4 errors the Pioneers made and that essentially is how Lititz won. Big hitter tonight was Zach Shorter, who ripped a double up the right center alley in the bottom of the 5th inning setting up a second and third situation with no outs. The Oddfellows then scored 3 runs on 2 errors from fielding play and then a second error on a throw to the first baseman. Big play of the night? Colin Brubaker’s bases loaded fielding on a bunt play and the perfect throw to get the Pioneers’ runner at the plate. That saved a run. SWS did score two runs that inning after that play but Colin got out of what could have been a big inning for SWS. This was the 72nd LNP Midget Tournament and Lititz has recently won it in 2006, 2008, 2011, 2013, 2015 and now 2017. Why the dominance? I’m beginning to think the people in Lititz with baseball in their blood do not take vacations until August. It’s local. And you won’t believe how much fun it is. They offer paintball and what is called Air Soft as well. Check them out. 717 989 4519. Thanks for providing these game highlights! Even though SWS lost this game, this is a great keepsake! Congratulations to Colin, John, Dagen and the Lititz team!